How to reset trip meter computer and odometer display on a Fiat Ulysse. 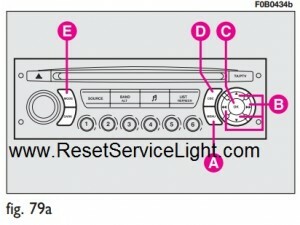 Multifinction display with sound system controls see below picture. A – button for opening the main menu. B – buttons for surfing the main menu. C – button for confirming the selected function or for confirming set values. D – button for canceling the function / going back to previous screen. E – button for selecting the type of information displayed on the right side of the screen (date, radio – CD, trip computer). 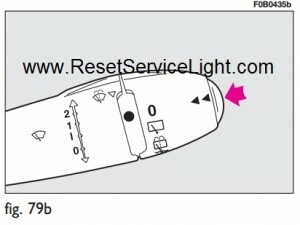 Trip computer: to display info concerning: range, instant consumption, distance covered, average consumption, average speed, distance to destination; to display also info concerning: automatic light turning on, ESP, rain sensor. Personal/set-up menu: to activate/deactivate electric rear wheel lock, to activate/deactivate rear window wiper, to activate/deactivate automatic light turning on and to set date, clock, display brightness, units and language. on the upper line: partial kilometres and engine oil level gauge (for versions/markets, where provided). 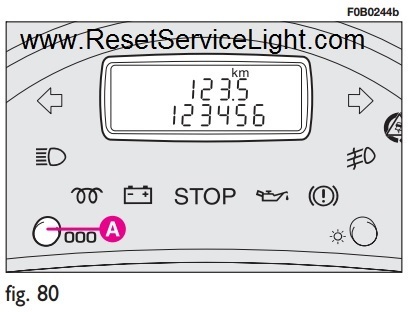 on the lower line:total kilometres and programmed maintenance indicator; versions with automatic gear are also fitted with engaged gear indicator (for further details see the chapter “Automatic gear”). Press button A to display the trip kilometres. Keep it pressed to reset.